Let’s face it: some burger joints—especially these eight—are so good they’re worth a little time on the road. But instead of turning around and driving home after your delicious feast, round out your field trip with a bit of sightseeing. To help you plan, we’ve identified a must-see attraction within easy striking distance of each burger joint. All you need is an appetite—and a bit of curiosity. It’s all about variety at Hops Burger Bar, which serves local Angus beef, veggie, turkey and bison patties aboard brioche, pretzel, sriracha and potato buns. Toppings abound for DIY types, but consider leaving your combination to the Hops’ professionals, who have created taste sensations like the fried onion, bourbon pickle and barbecue sauce-topped Pickleback. Fries come a dozen ways—try them Buffalo style—or give the nacho style a go. No matter the weather, or the season, there’s always something going on at this indoor/outdoor center that includes a small zoo, a 3-D theater, a treetop ropes and climbing course and an aquarium. 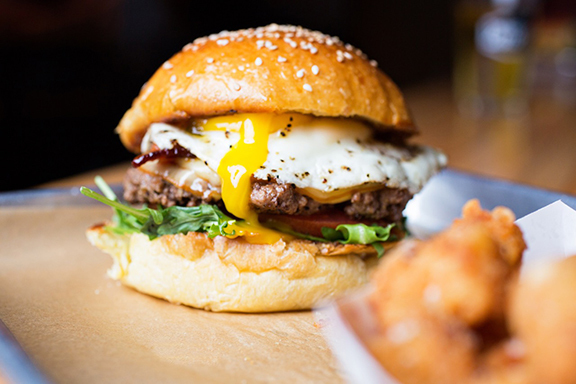 Traditionalists love The Fork n’ Cork’s The Big Lew bacon cheeseburger, but when you’re ready to branch out, consider the Duck, Duck, Goose, a ground duck patty gussied up with pâté, a fried duck egg and a port wine cherry sauce. Daily specials like the tamari-topped Peking Duck burger or the Gaucho (chipotle cheddar, avocado crema, tequila glazed onions and habanero peppers) make the decision even more difficult. Founded in 1739 on the banks of the Cape Fear River, Wilmington’s nearly 300-block historic district is filled with diversions. Tour the Burgwin-Wright House, which was British Gen. Charles Cornwallis’ local headquarters; explore the USS North Carolina; take in exhibits at the art or science museums, shop or just stroll along the Riverwalk and enjoy the views. Lots of places brag about making toppings in house; at Bull City, nearly everything on the menu, including the buns, bacon, mayo and even the beer, is made on-site. Although it would be easy to fill up on the addictive bacon-and-sugar-covered Bull Nuts and hot, soft rye pretzels, save room for the main event, particularly if you like your burger topped with bacon and pimento cheese. If you can’t make it to a Duke basketball game, consider a visit to the team’s museum, which is filled with memorabilia, trophies and videos from the Blue Devils’ five NCAA championship wins and 19 ACC Tournament championships. The museum is free, but closed on weekends except during home basketball and football games. Only beef, lamb, chicken and pork from ethically-raised, local animals make it onto the menu at this growing farm-to-table restaurant chain, which opened in Asheville in 2013. Although trendy toppings abound–think oxtail marmalade and smoked paprika mayo—old-school favorites like iceberg lettuce and Duke’s Mayonnaise will please purists. Save room for milk shakes, root beer floats and, if you’re not the “DD,” adult floats infused with hard cider and chocolate stout. You’ll never have to worry about running out of quarters at the Asheville Pinball Museum: for $13, you can play as many pinball and vintage video games as you like, for as long as you like. Note that the museum is closed on Tuesdays and doesn’t open until the afternoon the rest of the week. Edgar Allan Poe wrote “The Gold Bug” while he was stationed at Ft. Moultrie on Sullivan’s Island; everyone can enjoy Poe’s Edgar Allan Poe-themed burgers in a rambling clapboard cottage a few blocks from the ocean. If you’re craving seafood, try the Annabel Lee Burger, which is topped with a crab cake. Beyond a few restaurants, galleries and single-family homes, there’s little development on Sullivan’s Island, meaning that the wide beach tends to be less crowded than its neighbors, even on weekends. Bring a chair, a cooler and spend the afternoon enjoying the surf. When this Greenville landmark opened in 1954, a chili-cheeseburger cost 40 cents and sweet tea was a dime. Prices have risen a bit since then, but the flavors haven’t changed: the double-napkin chili cheeseburger can still be ordered “half & half” with fries and homemade onion rings and the sweet tea is brewed fresh. Highlighted by a pedestrian bridge that arches over Reedy River Falls, Falls Park is a glorious oasis of gardens and public art in downtown Greenville. Stroll the park, or grab a bike at one of the city’s B-cycle stations and ride the Swamp Rabbit Trail, and urban bike path that meanders for 21 miles through a landscape dotted with fountains, historical markers and activities for children. No reason to leave: The Alley is also home to Charleston’s only public bowling alley. In addition to eight lanes, you’ll find vintage video games, skee-ball, “Ping-Pong” tables and two giant projection screen televisions. First-timers often get lost looking for Rockaway: the parking lot (and main entrance) are out back and there’s no sign on the hulking building. For burger lovers, though, it’s worth seeking out, especially for the particularly creamy pimento cheese, which comes oozing over burgers or poured over fries. Extra jalapeños are a favorite add-on. It’s easy to spend an entire day at this diverse complex, which comprises one of the nation’s top zoos, a 70-acre botanical garden, a rock-climbing wall, a zipline canopy tour, a ropes course adventure and a walking trail through 19th century river mill ruins. Summer is the perfect time to get out and explore Carolina burgers and cool sites, visit AAA.com/Maps to plan your route and visit AAA.com/Travel for hotel reservations if you plan to spend the night.